Adam has been in the mobile game industry since 2007, creating games independently. He's since grown into a full 50+ person studio manager. Recently he's taken a position at Wooga in Berlin to sharpen his design skills and work with the world's best to create amazing, well-crafted products onto the mobile marketplace. Adam Telfer is Co-founder and Consultant at Mobile Free to Play. This article was originally published on Mobile Free to Play on July 6th 2017. When Supercell launches a new game, it sends shock waves around our industry and players alike. On June 14th, Supercell released Brawl Stars - and in typical fashion, we all jumped on to give it a try. But there was something special about when Supercell launched Brawl Stars. The game was Supercell’s first outside of the strategy genre. 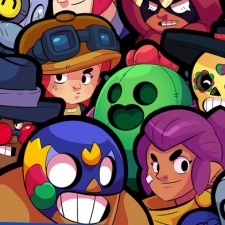 Brawl Stars is the first action-based multiplayer game for Supercell, and notably, the most casual MOBA-style game launched for mobile to date. Supercell also publicised the launch, beginning with an eSport-style tournament. This isn’t a typical soft launch; they are already building up a massive community and driving a strong streamer culture around this game. This was a bold move for Supercell. It has been known to stop games such as Battle Buddies, Smash Land and Spooky Pop when they don’t look like they will become a top 10 game. Going into this soft launch with so much confidence is bold. But weeks after the game has been launched, industry veterans began to weigh in and started noticing the cracks in the design. Many have already dismissed the game as an unlikely game to launch, despite having a massive following already from streamers and eSport fans. Currently, the game is sustaining in the top 10 grossing in Canada and driving a massive community around it. Despite the concerns, this game could end up being a surprise hit due to the strong multiplayer gameplay. It fails to deliver on what a gacha system needs to do, and it will ultimately not last in its current incarnation. But ultimately, as a game designer, what I see from Brawl Stars is an amazing game that is weakened by a poorly designed gacha system. It fails to deliver on what a gacha system needs to do, and it will ultimately not last in its current incarnation. Comparing the system to Clash Royale, Brawl Stars' system is considerably weaker and will result in lower revenue on a per player basis. Even if Supercell can drive downloads organically, this will hold it back from where it could be. While I believe the game is incredibly fun to play and may just succeed based on its multiplayer component alone, ultimately the game will be weak on a revenue-per-player basis. What is it about the Brawl Stars mechanics which weakens the gacha? That comes down to depth. Something to clarify is about how designers look at the depth of a gacha system, and why this matters. The depth of a gacha system ultimately defines how long it will last, roughly what the maximum spend a player could spend to reach the end of content, or how long a player would need to play before reaching the end of content. This is usually defined as the number of drops it takes to complete the gacha. A “drop” in a gacha is defined as giving away a single item. For example, in Clash Royale a drop would be synonymous with a single card dropped from a chest. Some designers also call this a “pull” - but for this article, I will call them drops. Keep in mind that a drop does not mean a chest. A Chest has multiple drops in the case of Clash Royale, but a chest in Brawl Stars only contains a single drop. Also, not all drops are alike. 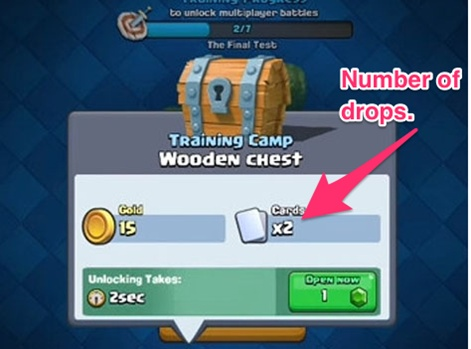 A drop from a legendary chest in Clash Royale is not the same as a drop in a wooden chest, since the legendary chest has different probabilities for selecting higher value items. But when roughly measuring the depth of a gacha, you can ignore (average out) the “quality” of a drop. Content is usually the easiest problem to point to with a shallow gacha system. Drops are important because the ultimate goal in free to-play-games is to maximise long-term retention and maximise the cap of the economy. To drive strong long-term retention, players need to have a long-lasting sustained desire to pull from the gacha. The more drops this takes, the longer the system will last. The more drops a gacha can sustain, the more generous a game can be, the higher revenue per player, and the higher the long-term retention would likely be. On this metric, Clash Royale’s system dominates Brawl Stars, comparing their soft launch states. Designers usually have three key variables to maximise depth: content, duplicate mechanics and pacing. In all three of these cases, Clash Royale’s systems outperform Brawl Stars. Content is usually the easiest problem to point to with a shallow gacha system. Brawl Stars has 15 characters (for now) whereas Clash Royale had 42 at their soft launch. What this gave Clash Royale was a longer period of time in which players were likely to get new content, as well as the ability to control the pacing of the introduction of this content. 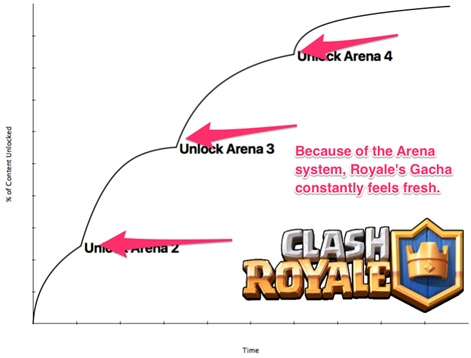 With 42 cards at launch, Clash Royale was able to pace the pool over time using Arena tiers. So players knew they needed to play for awhile before they could even gain access to some of the upper tier cards. On top of this, because they were able to launch with this much content, each interaction with the gacha system felt novel and interesting, especially between arena tiers. So playing through arena one, each time you opened up a gacha chest you typically got new cards. Each time you levelled up to a new tier, you were introduced to a whole new set of cards, all of a sudden the gacha got way more exciting to open (even inciting purchases like the limited offer for each tier!). For Brawl Stars, with 15 characters, all available in the gacha from the beginning, with only a few as legendary, this leaves Supercell in an inflexible position. They need to keep all 15 in the pool from the beginning, otherwise, players will get duplicates too fast from the gacha. By only having a few legendaries, the path to complete the gacha feels fast. As a paying player of Brawl Stars, I’ve dropped a small amount of money, but already feel like I’ve unlocked a majority of the content that the game has to offer. With more content, Brawl Stars would have considerably better control over the player experience and make it last far longer. For Supercell to correct this problem it may not come in the form of new characters. Brawl Stars gameplay is not the same as Clash Royale. Clash Royale’s core gameplay supports and pushes players to have a collection of cards, especially since each battle requires eight cards chosen. Brawl Stars only asks the player to choose one character. If they add too many characters, this may lead to players losing the desire to collect them all. Having too many characters can lead to players just choosing one they like and ignoring the rest. 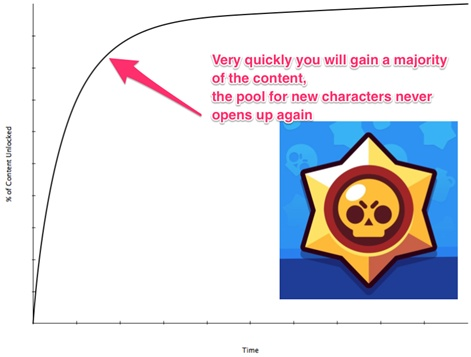 Brawl Stars will need to find new ways of dropping desirable content, and it may not be in the form of characters. Content can come in the form of special abilities, perks, equipable weapons, customisations, which each could add considerable depth to the progression system, and drive players to upgrade more than just their favourite character. Content typically isn’t a terminal problem on its own. Content is simply the base in which the gacha total drops has to work with. If content were the only thing that was important, Hearthstone’s 1,000+ card collection would dominate over Clash Royale, but this isn’t the case. The fact is that Clash Royale got away with significantly less content than Hearthstone at its launch because of its duplicate system. Even with a smaller set of content, a strong mechanic for handling duplicates can make a gacha mechanic last. The most terminal problem that was introduced with Brawl Stars was the mechanic for handling duplicates. 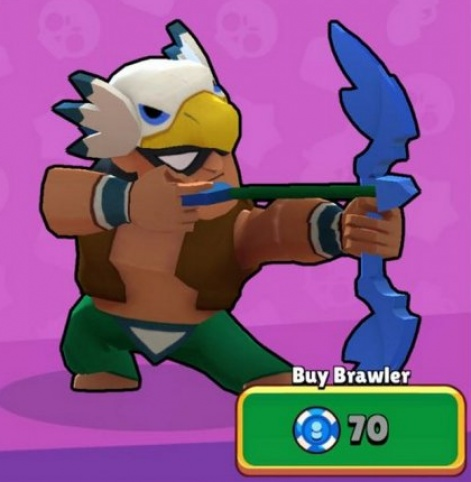 In Brawl Stars, getting a duplicate character in the gacha meant that you were instead rewarded with a single blue chip. This mechanic is similar to Hearthstone, where you can exchange duplicate cards for a small amount of dust. Players can exchange the blue chips in for unlocking characters, although the number of blue chips necessary to unlock many of the rare characters is insane. As a result, each time I have purchased gacha packs from Brawl Stars I’ve felt completely regretful. After I unlocked a majority of the characters, each chest has a high probability of dropping a single blue chip over unlocking a new character or gaining some elixir (the currency necessary to upgrade your characters). Having a string of gacha packs that just give out blue chips, especially if you’ve unlocked all the content, would surely cause many players to churn. Clash Royale doesn’t have this problem because it drives significant value from its duplicates. Duplicate cards are necessary to upgrade the card. Getting a single card unlocks the card for use, but to have the fully upgraded version of the card, you need duplicates of it. This is what makes Clash Royale’s gacha system last. Thinking in terms of the number of drops, even with a base amount of content of 42 cards, requiring each card duplicate to be found hundreds of times (depending on rarity) exponentially increases the number of drops necessary to reach the end of the economy. Even thinking about maximising a single legendary card can show you that it takes a lot of drops. 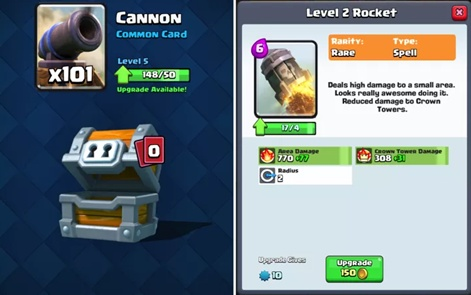 It’s reported that Supercell drops one legendary card 0.43% of the time in their gold level chests. If we use this as a base, and a pool of six legendary cards, that leaves the percentage of dropping your chosen legendary to be 0.0716%. In order to upgrade this card fully, you need 37 drops of this card. So, on average, a player will need over 50,000 drops before their single legendary card is fully upgraded. That’s a system that LASTS. For Brawl Stars to utilise its minimal content better, it needs to think about duplicate mechanics similar to Clash Royale. So for Brawl Stars to utilise its minimal content better, it needs to think about duplicate mechanics similar to Clash Royale. Potentially duplicates increase the max upgrade level of a character. Potentially duplicates unlock new special abilities. Without it, players will simply lose interest in the gacha, or feel as though the high price tag to purchase chests are just not worth it. With gacha systems, designers have one final variable to control how long their gacha lasts: pacing. Clash Royale gives a lot of drops daily. With free chests, crown chests, clan chests, and regular chests, each day players can get plenty of free drops to feel progress. This is mostly because Clash Royale’s duplicate system multiplied by their high amount of content supports such a high amount of drops. With Brawl Stars, because of the low level of content and the fact that duplicates aren’t necessary, this left Supercell designers in a bind. They had to pace their gacha significantly slower. They did this by tying chests to coins, and by making chests only give one drop each. Comparing this to the experience of opening a chest in Clash Royale, Brawl Stars' gacha boxes are far less rewarding. The reward pops up, you get a single currency of something, and then you’re left feeling “that’s it?”. This problem is magnified when each drop can cause an amazing or terrible feeling. If I get a new character or some elixir, this feels good. If I get a blue chip… I feel like all the time I put into collecting coins for that box was worthless. Brawl Stars has the DNA of the next Supercell hit. They may just need to make some last minute adjustments to make it the next billion dollar game. Clash Royale’s chests on the other end can guarantee rare or legendary cards, and even if I get a duplicate, it still feels beneficial. So even as I reach the mid-game and end-game where I have a majority of the content, every time I open a gacha I feel like I’m making progress, and I have a chance for big gains. Supercell had pace Brawl Stars chests this harshly because their economy only supports a certain amount of drops. If they increase the number of drops a chest will give, this will mean they either need to increase the pacing (increase the cost in coins to purchase a chest) or they will be allowing players to speed through content significantly faster - something they can’t afford with the low amount of content they have so far. Supercell’s Brawl Stars is an amazingly fun game to play. As the community has shown, there is a huge desire to play an action-based MOBA on mobile, and clearly, Supercell has capitalised on this with Brawl Stars. This game has a strong chance of succeeding simply based on its rabid community building around its multiplayer core gameplay. But as we know in free-to-play, a strong core gameplay is only the first step towards success. For Brawl Stars to become a Supercell-sized success, it’s about how long their systems last. Improvements could come with more content, it could come from better pacing of the gacha, but driving more sustainable drops likely will need to come from a better mechanic for duplicates to avoid a content treadmill. Taking a page from Clash Royale’s system and finding a way to make duplicates a key part of reaching the end of content for its gacha mechanics. Doing so will exponentially increase the lifetime of their gacha systems, plus drive stronger retention and monetisation from their user base. Brawl Stars has the DNA of the next Supercell hit. They may just need to make some last minute adjustments to make it the next billion dollar game. I’ll be cheering for them.